November 11th 2018 will mark the centenary of the end of the First World War. I read in my newspaper that there are plans for bells to ring out across the country to commemorate the event. Bells are thought to be particularly appropriate because the Defence of the Realm Act of 1914 had severely curtailed the amount of bell ringing that could take place for the duration of the war so church bells were rarely heard. The Local History Group are planning to reinstate their World War 1 display in St. Andrew’s church to honour the event and we will be pleased to hear of any other plans to celebrate the occasion. On Wednesday October 31st we have booked Derek Gore to talk about ‘The Roman Conquest and the Settlement of Devon with particular reference to the Ipplepen Dig’ and in late February/early March (date to be confirmed) Professor Steve Rippon will be coming along to update us on this year’s findings at the dig. Tony and Jennie Meek kindly sent us some old pictures the other day and looking at the picture of St. Mary’s, the Roman Catholic Church, we were unable to decide the exact year when it closed. We know that it opened in 1974 and occupied the site of the current St. Mary’s close development. 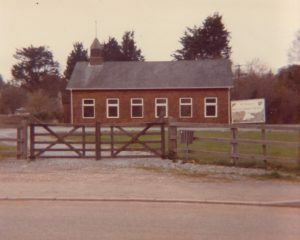 Here is a picture of it from 1977 to stir up a few recent memories.